78. 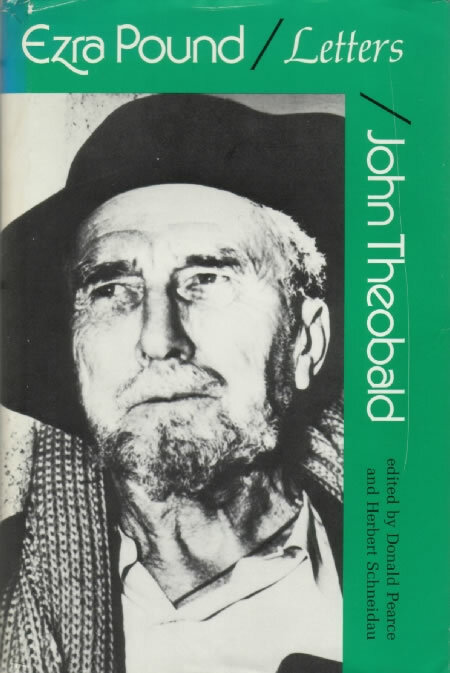 Ezra Pound John Theobald Letters. Edited by Donald Pearce and Herbert Schneidau. Redding Ridge, Conn.: Black Swan, 1984. In April 1957, while working on a poetry textbook for children, Theobald wrote to Pound at St. Elizabeth’s, beginning the eleven-month correspondence printed here. In an introduction to this volume Theobald suggests that Pound was interested in maintaining the correspondence because he ‘was a lonely man . . . who needed somebody to talk to who wasn’t a fellow inmate’, but surely Theobald’s acquaintance with modern Japanese poetry had something to do with Pound’s interest as well. Theobald is acknowledged in Ichirô Kôno and Rikutarô Fukuda’s Anthology of Modern Japanese Poetry (Tokyo: Kenkyusha, 1957), but according to Theobald’s letter to Pound of 15 September and Pearce and Schneidau’s editorial notes Theobald along with Kôno was in fact responsible for the translations, and Pound in the correspondence turns frequently to questions and comments about Japan and Japanese poetry. a. 3 August 1957. Apparently Theobald had been in contact with Kôno about arranging translations of Pound’s work into Japanese, for Pound asks Theobald here to ‘tell Ichiro the one thing I most want to go INTO jap[anese] is Trax [Women of Trachis (61)]’, because ‘only Minoru [see 82c1] or the other Noh co/ are fit to do it’. b. 13 August 1957. Pound notes that a poem by Nishiwaki Junzaburô (see also BD7, BF26c, and d below) has appeared in the journal Edge, advises Theobald about a journal to which he should send translations of ‘vivid japs’, and inquires in passing about Earl Miner’s work (see especially A25). d. 17 October 1957. Pound writes that Iwasaki Ryôzô (see 82c) has sent him ‘the Japthology’, presumably a reference to Kôno and Fukuda’s anthology, and though he is pleased that Nishiwaki Junzaburô is represented, he wonders if the reason Iwasaki is not is that ‘a cleaner gang is in opposition’. The letter ends with an inquiry about whether Theobald ‘know[s] anything re Kenkyusha Pub. Co.’.